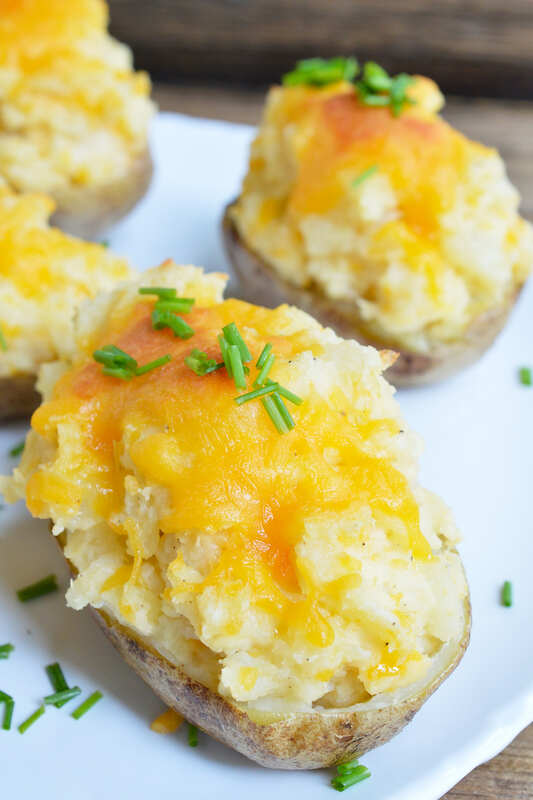 These Easy Cheesy Twice Baked Potatoes make the perfect holiday side dish! Learn a little trick that takes this stuffed potato recipe to the next level. This method makes the potato skins super delicious! My favorite part of comfort food meals is usually the potatoes. Fried, mashed or baked, I haven’t met a potato I didn’t like. 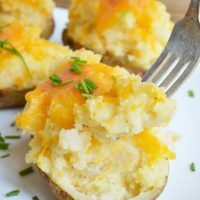 These Easy Cheesy Twice Baked Potatoes bring together two of my favorites, cheese and potatoes. Potato skins can be a little tricky. If they are not cooked properly you will end up with a bland, dry potato skin that is more like ancient Egyptian papyrus. However, if you salt and oil the skins while baking they turn out deliciously moist and slightly crispy. 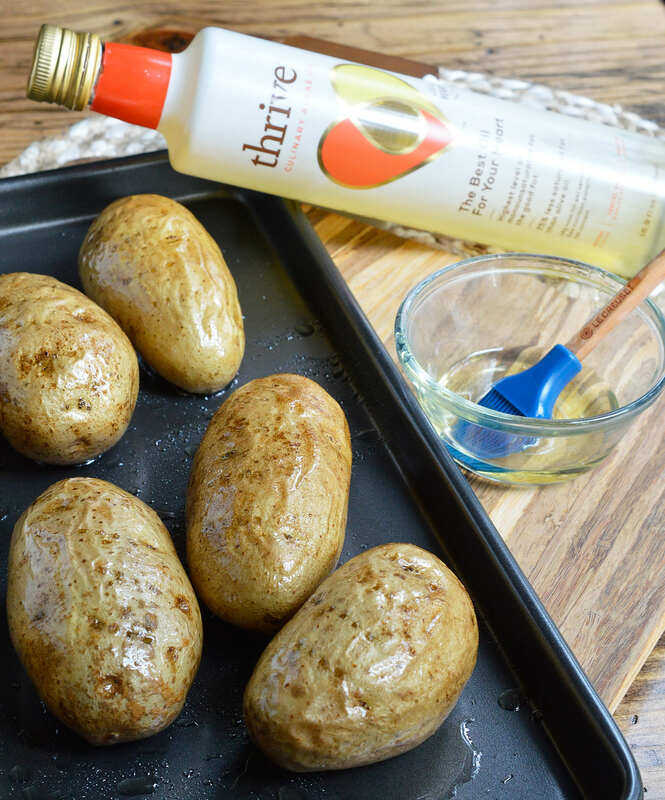 I use Thrive® Algae Oil to get perfectly crisp potato skins. Thrive® Algae Oil has a mild, delicate flavor and smell. It is perfect for any type of recipe because it has a crazy high smoke point of 485°! And, Thrive® Algae Oil is sustainable. Their mission is to create an oil that is better for people and the planet. 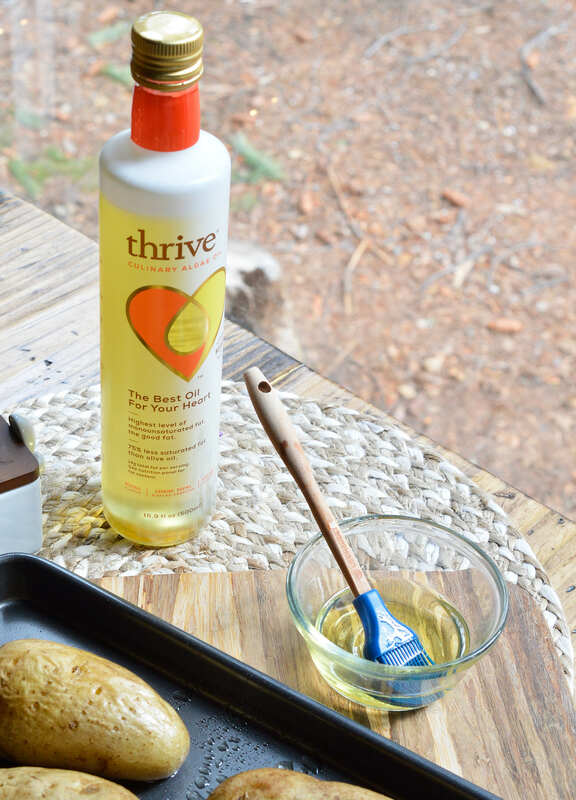 I’ve used Thrive® Algae Oil to make Cheesy Zucchini Tots, Black Bean Burgers with Cilantro Lime Slaw, Sweet Chili Sauce and Butternut Squash Pasta Salad. Learn More & Get Cookin’ the Heathy Way. . . These Easy Cheesy Twice Baked Potatoes are anything but bland and boring. My daughter, who is not a potato fan, eats several of these Twice Baked Potatoes in one sitting. The tasty skins are filled with fluffy whipped potatoes and loads of cheese. Then topped with more cheese. Can you ever have enough cheese? Me thinks not. Baked to melty golden perfection then topped with fresh chives. This side dish goes great with just about any meal. 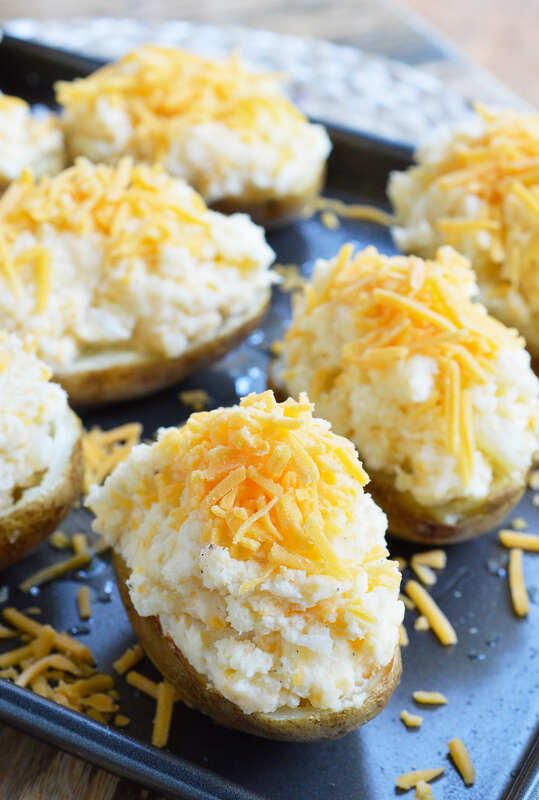 These Easy Cheesy Twice Baked Potatoes make the perfect holiday side dish! 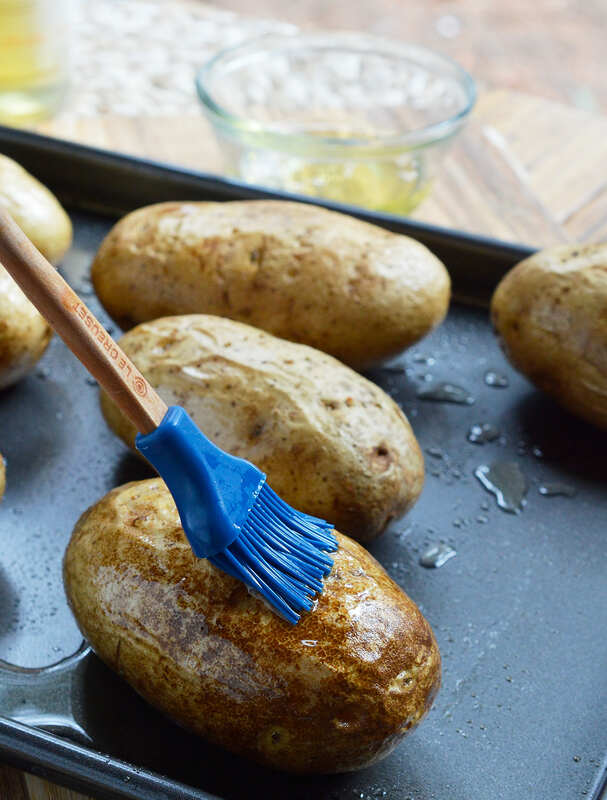 Learn a little trick that takes this stuffed potato recipe to the next level. Oh I am curious about this oil, I will have to look for it. The potatoes look delicious! 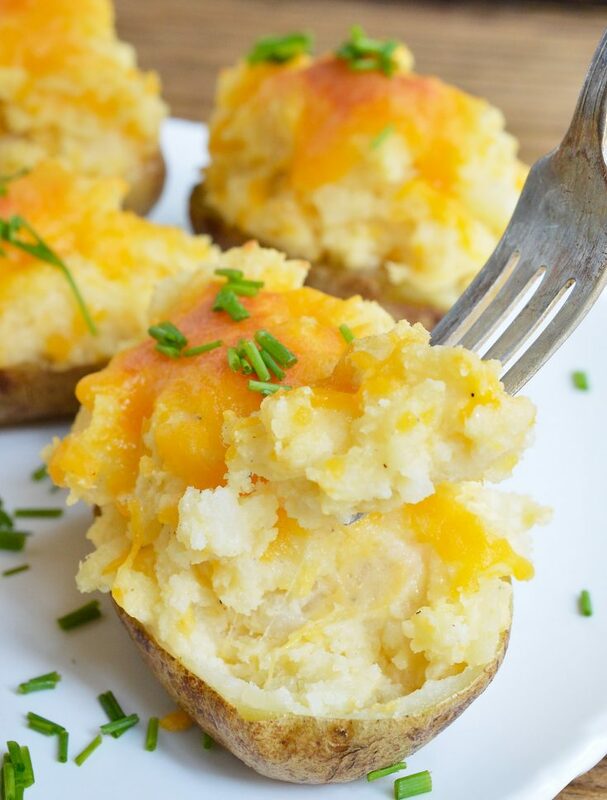 Twice Baked Potatoes are one of my favorite sides to make and these look fantastic, Nicole!